Recapitulating over my start in the field of enterprise consulting, I looked back to the year 1984, when I began a professional phase as a full time professor at the Tecnológico de Monterrey Campus Monterrey and I had my first attempts at entrepreneurial consulting regarding topics of an unavoidable engineering nature: processes improvement, analysis of failures in mechanical pieces and design of mechanical components. Then in 1990, a little before I moved to Leon Guanajuato due to an agreement with the Tec (Tecnológico de Monterrey) but now at Campus León, I was to live an experience that made an important impact on my perception of the reality of companies. It turns out that I was faced with, along with a colleague and a group of students, a challenge 100% mechanical by a Company from Monterrey. A challenge which – despite all of our efforts and talents – we were unable to work out. At the end we were running out of time. We had to face the truth and talk to our client, on one hand, to tell him we had not been able to solve the problem; and on the other hand, to ask for his authorization to carry out some tests of materials of a destructive nature, which would permanently damage the equipment we had been supposed to repair in the first place. To our surprise, our client agreed to our analysis and arguments, so we did the destructive tests, which implied meticulous analysis of a metallographic nature. What we saw under the microscope shocked us and also led us to discover a plain act of internal sabotage. This was the first of many experiences in which my material and objective world crumbled before the subjectivity of human behavior. And these turning points, that made an enormous impact on the beginning of my career, are what motivated me to focus on more balanced, more whole consulting topics; keeping in mind the unavoidable human dynamics in organizations. Later on, in 1992 I went freelance and started my practice as a consulter regarding topics of process of organizational change and strategy. I would frequently come across with what now I call the missing link between attitude and productivity. For when I recommended that my clients’ companies invest in training and human development, the first objection I encountered was: “And when will I see the tangible results of that investment?” to which I frequently answered something like this: Well, you have to bet on it and you will gradually see how your collaborators will improve the compression of the processes, and they will also develop a better attitude and so on. And the truth is that maybe 25% of the entrepreneurs that heard that recommendation DID follow it. And then, a few years later, they would see some signs of possible results, later and in a few cases, they would get amazing and tangible results that helped them to recover confidence in the decision of investing in the development of their collaborators. As years went by, I also started to confirm the immense importance the founder and/or general director has in the development of a proper organizational culture to attract and retain talents for the organization, and also to instill an inspiring and positive leadership to accomplish results. But I still had not been able to find or develop some sort of tool that clearly and directly influenced the attitude of the collaborators of a company; their productivity and as a consequence, their profitability. 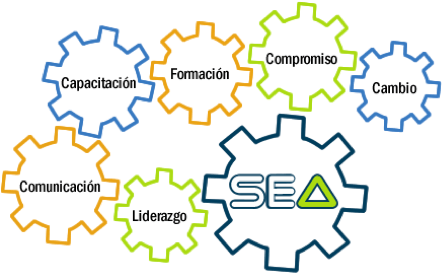 It was so that exactly one year ago, in October 2013, we were contacted by a company from Guadalajara who offered us a tool named: Efficient System of Attitude (SEA for its initials in Spanish). And as we were listening to them and understanding their proposal, we gradually realized (I especially did) That what I had before my eyes was the famous missing link needed to be able to MEASURE in a quantitative form and in pesos and cents the investment return of the development of collaborators in a company. With a very special emphasis on developing a better ATTITUDE on the collaborators part, aside from the efforts to develop skills that are always necessary to do a good job, the SEA focuses on developing the attitude and measures the quantitative effects of doing so with a series of indicators of organizational performance, including, amongst others, levels of commitment, communication, responsibility, goals achievement and… productivity! Furthermore, within the SEA proposal; a change of paradigm is included, which is key in the process of implantation. It consists on making it mandatory that the General Director of the Company be the one who leads the whole process of implantation and deployment of the Efficient System of Attitude, for the methodology itself favors that during the change of attitude of all collaborator, such change also takes place within the principal leader of the organization. Gradually creating a higher sense of belonging to the company and a positive and proactive attitude oriented to results throughout the 52 weeks that the program consists on. 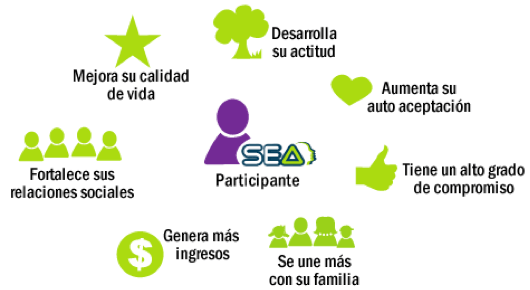 Generating also a common language among all the participants in the SEA, with positive effects on their personal, organizational and group performance, to the point that the families of the collaborators see themselves positively affected. 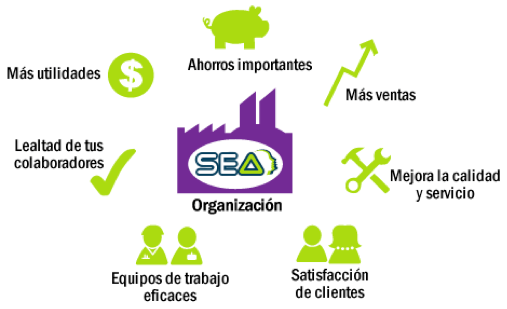 External clients of the company also detect the positive effects of SEA. In the last 17 weeks of the program, the participants are already focusing on specific projects of continuous improvement for the company, but that does not mean that it is only then when you will begin to notice changes in your company, for during the 30-week period when they are presented with principles and values is where people begin to realign their mental models and start changes of behavior that synergize positively among the participants in the SEA. Also something very interesting about the model of implantation of the SEA, is that it includes a guarantee of satisfaction which dictates that if after two months of having started the implantation the clients are not satisfied; the project is suspended and you get a 100% refund of what you invested. By the way, one of the clients of Novarum, who is now going through the SEA experience in his company, told us: “I do not see why you should NOT try it”. 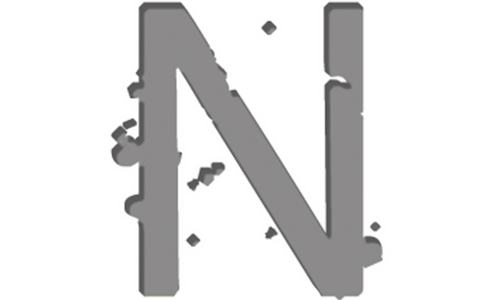 We can also show you without any cost, how to design a process of internal change in your Company, incorporating along with the SEA other complimentary tools developed by Novarum throughout 30 years of experience in the field of Company consulting in Mexico and abroad.